Are you a New Brunswick employer looking to expand your workforce or hire university talent? FutureReadyNB can help! 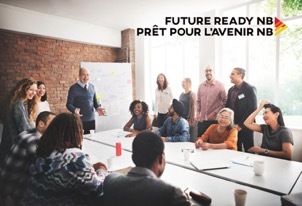 FutureReadyNB was created in response to a provincial task force report that called for expanded experiential learning capacity and work opportunities for New Brunswick university students. The initiative is a partnership between New Brunswick employers, public universities, students and the government, and provides funding and coordination support for students to pursue off-campus work and learning experiences. The goal is to support employers in filling labour gaps while providing students with New Brunswick-based job experiences before they graduate. Ultimately, FutureReadyNB is intended to support economic growth, and help with employment recruitment and retention of educated New Brunswickers. What else can FutureReadyNB do for New Brunswick employers? Want more news like this? Subscribe to our newsletter. Newer PostGirls STEM UP! Hey high school and university girls – This event is around the corner!